When it started the War of 1812, the United States was still a very young nation. The revolution had ended only thirty years earlier, and the relationship between the federal government and the states was under intense negotiation. The country consisted of seventeen states, but it was growing fast. The Louisiana Purchase of 1803 added vast territories, and westward expansion created tensions with native Americans. At the time of the War of 1812, Britain was in what seemed to be a perpetual state of war against Napoleon’s France. Napoleon’s armies dominated Europe, and Britain’s naval superiority seemed the only bulwark against the French. At best, the War of 1812 was an irritating distraction to the British; at worst, it played into the hands of Napoleon by diverting military resources to North America. 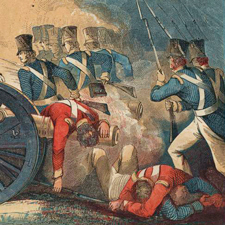 The War of 1812 was fought between the United States and Great Britain between 1812 and 1815. 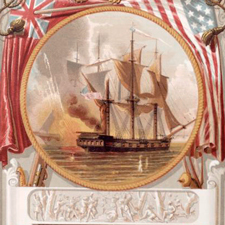 A number of political, ideological, and economic forces contributed to the United States' decision to declare war in 1812. Efforts by Britain and France to restrict enemy trade with the United States wreaked havoc with the U.S. economy throughout the Napoleonic Wars, and U.S. response to the restrictions was at times disastrous. In its fight against Napoleon, the British Navy experienced great difficulty in manning its ships. Its conscription of sailors taken from American merchant and navy ships was viewed as a grave affront to the sovereignty of the United States and the rights of its citizens. By some measures it was a war that neither side won. Nor did either side really lose. 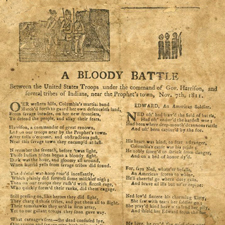 For U.S. citizens, its most lasting effects were the origin of the national anthem and a generation of political leaders who rose to prominence during the war. That the history of the war is not well known is quite understandable. It is overshadowed by conflicts that are easier to understand and whose effects were much more dramatic and obviously significant. Yet the War of 1812 deserves closer attention. It played an important role in the development of ideas of nationhood in both the U.S. and Canada; in the evolving relationship between the states and the federal government; and in the development of the United States military forces. The conflict was most important to Native Americans and residents of British North America. For Native Americans, the war delivered a death blow to their resistance to white Americans pushing westward. For residents of Canada, the war looms much larger in their national narrative, as an invasion by a hostile neighbor, heroically repelled. This web site provides an overview of the War of 1812, outlining the major military conflicts as well as the principal causes and outcomes of the war. More importantly, the site provides access to fully digitized books and manuscripts for the use of anyone interested in exploring the War of 1812. The types of materials digitized include books, broadsides, prints, maps, correspondence, log books, legal documents, diaries, speeches, letter copybooks, orderly books, and receipts. Some of these items are described individually on the site. Many others can be found through the search and browse functions.